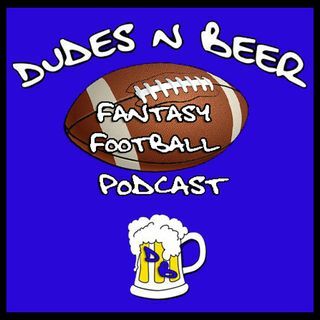 In this episode of the Dudes n Beer fantasy football podcast host Matthew McPeek is joined on air by fellow fantasy football fanatic Adam Nattress to discuss running backs on this episode, so buckle your chin straps and make sure your male athletic supporter is in its full upright position. What are some of the reasons good running backs help your game? We all know the reasons for having good quarterbacks, even good receivers and defense, but what is the strategic importance to running backs on ... Maggiori informazioni a good fantasy football team? Is it more important to focus on seasoned running backs that already have a foothold within the league or is it worth the risk of picking a rookie within your fantasy football draft? Why should you pay special attention to the running backs you draft and what are some of the best stats to look for in either veterans or rookies when drafting your players? These questions and more in this exciting inaugural episode of the Dudes n Beer fantasy football podcast! Download the FREE Dudes n Beer Podcast app for Android and iDevices or visit our LISTEN LIVE page and join the conversation.